Cosmetic Dentistry – Improve the aesthetic appearance of your smile. Dr. Matthew, DDS, MICOI specializes in creating and shaping teeth to look natural and fit each unique face. He is an expert dental hygenist and cosmetic dentist who improves the aesthetics and function of the teeth, whereas general dentistry focuses on dental health and maintenance. Contact Dr. Matthew today to learn what can be done to improve your smile! Implant Restorations – Dental implants are fused to your bone which creates a more stable, comfortable and natural look to each unique face. Traditional bridge or dentures can feel and look unnatural which may cause irritation to your gums. Single tooth restoration, fixed bridges, and over dentures are all forms of options for dental implants. 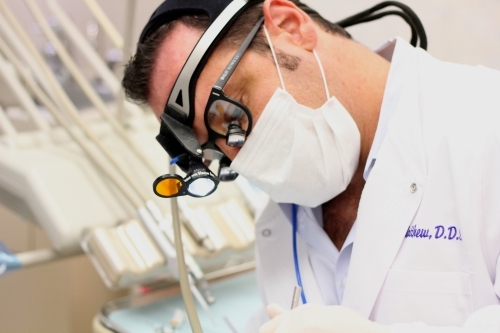 Dr. Matthew, DDS, MICOI proivdes the highest quality of custom-made Los Angeles dental implants. InvisAlign® – Braces without the harsh uncomfortable metal wires that causes irritation to your gums. InvisAlign® is a custom dental program that is created to fit your specific needs. Crowded, widely spaced, underbite, crossbite, and overbite teeth can all be corrected with InvisAlign®. Porcelain Veneers – Porcelain veneers are a great option for those looking to makeover their smile. Veneers can last between 12-25 years with proper oral hygiene and bi-yearly visits to Dr. Matthew, DDS, MICOI. They are a long-term solution to correcting almost any smile! Porcelain Crowns – Porcelain crowns are used to correct both functional and aesthetic problems. Crowns provide strength and durability to weak, cracked or damaged teeth due to old age or wear and tear. Porcelain crowns can be applied to provide a natural looking and long-lasting solution for each unique smile. Teeth Whitening – Brighten your teeth and feel confident about your smile. One of the first things people notice is your smile, so let us help you make a lasting first impression. A comfortable dental office teeth whitening procedure that can dramatically whiten teeth in less than hour. Pediatric Dentistry – It's hard being a kid growing up and even harder with crooked, tipped or damage teeth. At South Bay Smiles, we are dedicated to help your child feel confident by providing them with a beautiful and healthy smile! Tooth Extractions – For damaged tooth due to decay or fracture, it may be necessary to remove and replace the tooth. Extractions may also need to remove teeth that are causing overcrowding or blocking other teeth from coming in. Wisdom teeth are a common type of tooth extractions. Root Canals – When the matter in the center of a tooth becomes severely infected, endodontic dentistry may be required in order to remove the infected pulp and maintain the tooth. If left untreated it can affect the bone surrounding the tooth, causing an abscess - not to mention a great deal of pain. Bonding – Dental bonding is a quick and painless way to restore and achieve the smile you want. Although dental bonding is not as durable as porcelain veneers, bonding is an easy way to fix discolored, cracked, c hipped, or broken tooth. Cosmetic dentistry has never been so advanced as it is today thanks to durable materials used that offer a similar feel and can match the natural shade of your teeth. Whether it is to whiten teeth, to correct a crooked or tipped tooth, or to do a complete smile makeover, Dr. Matthews, DDS, MICOI can help you attain the smile you desire. Dr. Matthew, DDS, MICOI also provides emergency dental care and family dentistry. Contact Cosmetic Dentist Dr. Bradley Matthews at South Bay Smiles to schedule in an appointment and learn more about the producers and options that will improve your winning smile today! from His Great Dentist Reviews! South By Smiles improves patient smiles throughout all of Los Angeles including Marina Del Rey, Santa Monica, Manhattan Beach, Ladera Ranch, Westchester, Hawthorn, Venice, Hermosa Beach, Redondo Beach, and the surrounding areas. Dr. Matthews has over 17 years of professional dental experience. We provide a welcoming environment and always keep our patients informed. We are proud that our patients rave about their experience and services with 5-star reviews. We offer our patients same-day visits for dental emergencies.